After the long awaited victory against the airport project, we are trying to lift ourselves out of the brutal spring, a season marked by two phases of evictions in which the government made sure to avenge the affront that the Zad had represented for so many years. Following more than two years of regular building work and a new month of construction this summer, this week of August 27 to September 2, will also be the inauguration of the Ambazada, a space intended to welcome rebels and struggles from around the world to the zad of Notre-Dame-des-Landes. To honor and celebrate the opening of the Ambazada the obvious thing to do was to make a call for a new intergalactic week. We hope that it helps to bring back momentum and horizons before the autumn mobilizations at home and abroad. There are questions that have not ceased to inhabit us during this past season on the zad, these include : How throw down the anchor down for the long term without becoming domesticated, being community centred or more porous in our movements, the power struggles and frontal relationship with the state and possibilities for victories to last. We had to find our own partial answers in the emergency, we had to make decisive choices against the tanks and under dramatic pressure. We want to re question these issues and share them with other territories born out of battles and that have traced their own path. Part of the week will be devoted to open encounters with guests from the Wendland in Germany, Christiania in Danemak, the free district of Lentillères in France, Errekaleor in the Basque Country and perhaps Exarchia in Greece. Each of these territories will tell us the way in which they handled these issues, followed by a debate between all of us. At another scale, there are peoples everywhere resisting cultural assimilation and liberal ideology . A moment during the week of specific meetings on this subject is also under preparation. We will also propose that during some evenings you time travel across decades of significant struggles in different European countries. Revolutionary Italy in the 1970s, the German autonomous movements of the 1980s or the radical anti-capitalist ecology of the UK in the 1990s, among others, reconfigured our political language, actions and organizational practices. We dive back into these vibrant stories, in search of the legacies and imaginaries that they offer us, in order to think through the present. – an afternoon meeting with a Kurdish activist on the women’s liberation movement in Kurdistan, and her role in society and the movement. – A presentation of the political, social and struggles situation in Mexico following the presidential elections in July and the campaign of indigenous candidate Marichuy. – Testimonies of undocumented people in Nantes and groups who organize their support in squats and in their administrative procedures. An update on the asylum-immigration law. The feedback from a group that organized the occupation of the University of Nantes this winter with undocumented people and an overview of the current situation. -The mornings will be devoted to building work on various sites, to strengthen the zad’s commons, as well as to running the logistics of the camp. – Participants are welcome to offer contributions to the announced discussions. You can contact us to make additional proposals for workshops and discussions. However, we have made the overall choice to favor a few major themes and common moments in which to advance together, rather than to superimpose a multiplicity of parallel discussions. 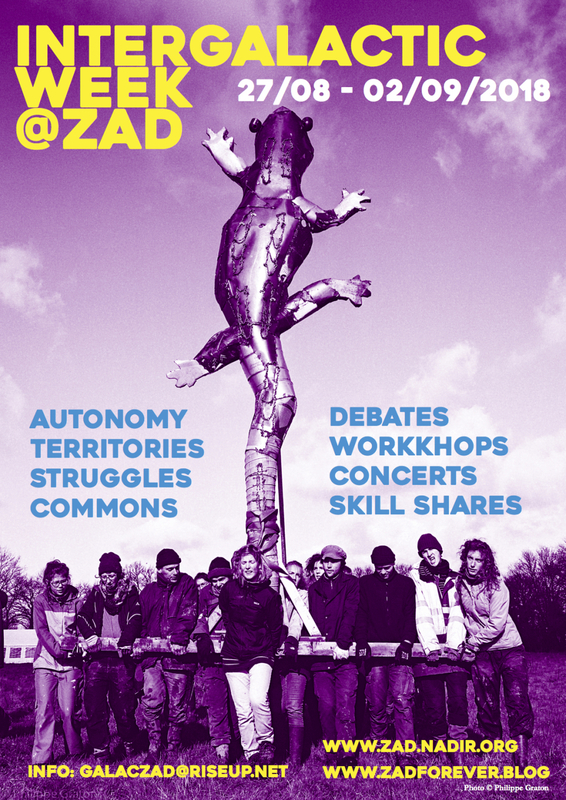 – We are thinking of organising another gathering in parallel at another site of the zad, with groups of trade unionists and students who will dedicate certain days of the week to take stock of their mobilizations of the past year and look to the future. We envisage cross pollination between those attending this and the intergalactic week . Tell us if you want to come !! We need to plan the logistics in advance, and therefore to know the number of participants ( we have provided infrastructure for about 300 people during the week). We hope that the participants will stay the entire week to take time for develop a sense of collective. Please let us know by July the 31st, how many of you will be present and on what dates. Canteen facilities will be organized on site, but do not forget to take a tent and a sleeping bag. Also tell us what language you speak to organize the translation. Image: Timber frames of the Ambazada being raised during intergalactic camp 2017. Zad.